March 16, 2019 April 22, 2019 - by Marcus Eriksson - 3 Comments. One of the newcomers to the ever-growing proxy service provider industry is High Proxies. Arriving on the scene in late 2015, High Proxies have done well to establish themselves as a serious provider of high quality proxies for professional internet marketers. They provide a wide range of different proxies to suit any type of marketer, with proxies that are designed specifically for websites such as Google, Instagram, Amazon, PayPal, Tumblr and many more. Their proxies utilize both username/password authorization and IP authentication for additional security. How Much Do High Proxies Cost? The price range for High Proxies are reasonable, and some of the best in the industry when you consider the fact that these are all virgin proxies. The private proxies cost over twice as much as the shared proxies, as you would expect, but the private proxies still come in at only $1.35 each. Every proxy comes with a free setup and guaranteed 24/7 support. High Proxies also specialise in a few specific proxies, which we haven’t personally tested, but have heard nothing but positive reviews about them. If you are fond of IP diversification, High Proxies are pretty solid. They currently have 18 different locations for their data centres, with 17 of those being in the USA. If you need more variation across Europe, you won’t find that with these, but the USA proxies are varied enough to keep you safe and anonymous during your campaigns. The USA data centre locations are all based in the major cities that you come to expect from proxy providers today. Cities such as Philadelphia, Miami, Los Angeles, New York and Portland are just a few of them. For the European locations, you are limited to just London and Frankfurt. Raid – They use RAID SATA hard drives to provide the fastest server swap and overall performance. Linux Based – Linux is well known for providing superior performance, stability, security and power. Their VPN’s all run CentOS. Powerful Intel Based Servers – For optimal performance and speed, High Proxies utilize Intel Quad Core XEON processors for their servers. 1000mb/s Speeds – All proxies run on a Gigabit network, providing unparalleled speeds and performance. Firewall Protection – All of their servers utilize a firewall for additional security. Plenty of RAM – All servers have 16GB of RAM available, allowing up to 100 threads per proxy. High Proxies is using a ticket-based system which works, but I found to be a little bit clunky. The clunkiness is not exclusive to High Proxies though – I’m just not a fan of them in general. With that being said, they do have a live chat option for any pre-sale questions that you may have. I haven’t tested the live chat option for any billing or technical support issues, so I can’t comment on that, but there always seems to be someone around. The responses were pretty fast. I received an answer to my question within 24 hours which is usually what you expect from most online services nowadays. Actually, there was one thing. The majority of proxy users who purchase from companies like High Proxies are typically running intricate software that requires an unmetered bandwidth and unlimited threads. The proxies I purchased from High Proxies were fast and consistent, but I didn’t like the fact that there was a 100 thread limit on them. I prefer to use proxies with no upper limit, just in case I want to really be aggressive with my campaigns one day. Other than that, my experience with High Proxies was generally positive. 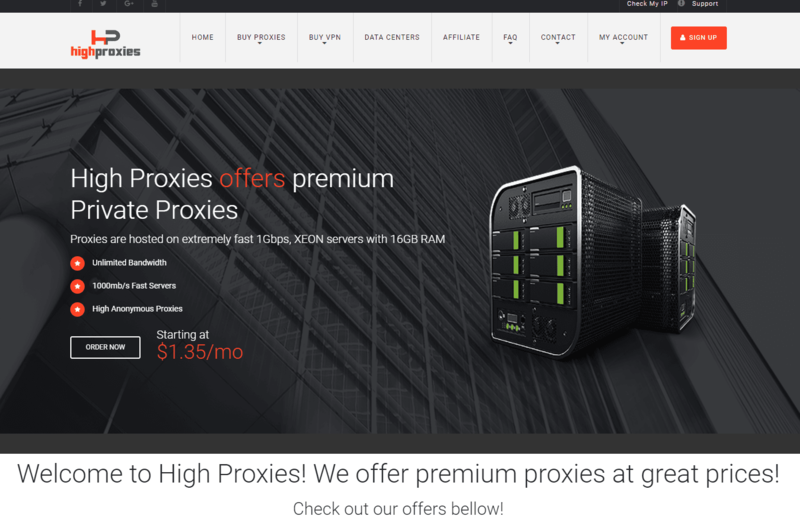 The proxies are fairly priced, they provided consistent performance with great speeds, the support staff are always on hand to help you out and they ave plenty of data center locations to choose from. Overall, I would definitely recommend High Proxies to people who are serious about their internet marketing business, regardless of whether you are an expert or a complete beginner. Their proxies are not fresh and new as claimed.I had an Instagram account DELETED after using their proxy – no doubt it was linked to a seriously bad account and by association, my account was deleted. I would try to explain in more detail to help clarify the situation, but they weren’t interested and they continued to tell me to read their t&c’s. I should have known from the start, I bought a proxy and requested it be from Australia and it was Paris, the next I requested from USA and it was in London. I’ve lost 2 clients due to High Proxies but I’m glad I only tested 2 proxies with them instead of buying 100 like I first intended for all my clients. My advice to anyone thinking of buying proxies from High Proxies is DON’T. Not only will you not receive what you pay for but their service is ABYSMAL. They are a scam site. There proxies are NOT virgin and they never give any refunds as they promised. All proxies they provide have a Facebook shadow ban.